What an unbelievable July! Temperatures in the 70s for several days. Unfortunately, a couple of those days we had a pretty good wind, so it actually felt cool at times! We are heading back into the upper 80s and low to mid 90s. Chances of rain Wednesday, and I think we may have a chance of rain over the weekend. To be continued…..
Generation has been it’s normal erratic. Not really off for the past three days. Friday was one unit which ramped up to a low two around 5:00 p.m. We have seen the equivalent of one to a little lower Saturday and today, Sunday. Projection for tomorrow is no generation until noon, then 2 units for an hour, ramping to a low three, then four units by 2:00-3:00 p.m. We will see four units for 5 hours. Trying to get caught up a little at a time. Stan on the water last Monday with Larry from Iowa. They had a half day of catching fish on a yellow egg and the black midge with a copper head. 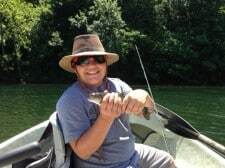 This was Larry’s first time with a fly rod and he did well. Tuesday, Stan took Mike and Clayton out for half a day. These new fly fishers from Texas had a good day on the yellow egg and the holographic green crackleback. There was only one unit on at about 1200 cfs for most of their time on the water. Nice! Carolyn had Jessica and Luis out for half a day. For his first time fly flinging, Luis did well. He had a couple on stripping a ginger wooly bugger and a few on and off on the black copper tunghead midge. Definitely was not a fast and furious day for these two, but it was a beautiful, cool July day. Darrell took Mike from Michigan out Wednesday. Weird day. Normally we have been seeing water on during the afternoon. Off, from midnight until noon or later the next day. Wednesday, it was on at midnight and continued until 7:00 a.m. the next morning. A slow day, but Mike boated some fish on the P&P midge. Thursday, Jim took Eric and Darren from Smithville, MO out for the day. Pretty good day for these guys even though there was no best fly. Darren was pretty new to the sport, so there was a bit of instruction for him while they were on the water. Darrell and Gina had a two-boat group out for half a day. Darrell took Dad, David, and Gina took the boys, Aaron and Tyler. Not a bad day for everyone on the P&P, chartreuse egg, and size 18 gray scud. 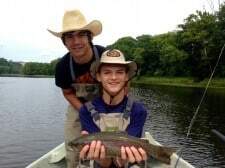 Couple of neat fishing buddies, Tyler and Aaron. This entry was posted on Sunday, July 20th, 2014 at 9:49 pm	and is filed under Fishing Reports. You can follow any responses to this entry through the RSS 2.0 feed. You can leave a response, or trackback from your own site.